The Indian establishment is keenly following political developments in the US. The primary season in the ongoing American elections has drawn to a close. The spotlight now shifts to the next stage as Republican nominee John McCain and his Democratic rival Barack Obama take each other on in the run up to the November presidential election. So, where do they stand on issues that are crucial for India? 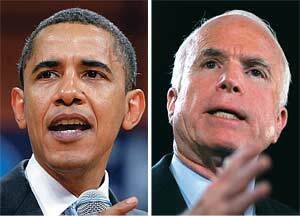 While McCain is conservative in his outlook, Obama is known to be a liberal. Needless to say, there are striking differences in their views on domestic and international policies. India figures fairly high on McCain’s list of priorities, but Obama’s position in this regard isn’t clear. The latter has been critical of Bush’s war against terror and has favoured the withdrawal of American troops from Iraq and Afghanistan. This stand, welcomed by Indian “liberals”, may hurt Indian interests as it will ease pressure on Pakistan and the jihadi terrorists backed by it who pose a serious threat to this country’s security. Then, Obama may also pull away from the Bush Administration’s policy of beefing up India’s security architecture. The emerging Indo-US geo-strategic clinch is critical for India’s, and Asia’s, long-term security, especially in the light of China’s covertly hostile stance on India. McCain, however, promises continuity in this regard, and so, is probably a safer bet for India. On the nuclear deal, which has important ramifications for India’s energy security and geo-political future, McCain is likely to be more accommodating of Indian interests than Obama, who voted against it in the US Senate. Nevertheless, security experts like K. Subrahmanyam feel that the deal, which serves the long-term American goal of containing China, will be clinched by any government that comes to power. “The problem of evolving a political consensus lies in India, not in the US,” he says. However, many senior IT industry executives are privately apprehensive of an Obama Administration. The Democrat has made outsourcing one of his main campaign themes, and this has found traction among an electorate increasingly wary of being “Bangalored”. Having raised the pitch, Obama may find it difficult to back down if he is voted to power. This can have far-reaching consequences for the Indian IT industry, which still depends on the US for the bulk of its revenues. Also, the deeprooted operational and financial linkages that have been established between almost all large US corporations and the Indian IT sector means that any efforts at untangling these ties will cause major economic disruptions in both countries. No wonder, policymakers and IT industry honchos are dreading the prospect of Obama coming to power. McCain, on the other hand, has gone on record as saying he has no problems with outsourcing and has realistically acknowledged the win-win nature of such deals for both countries. So, a McCain victory promises a continuation, and deepening, of existing policies, which will be beneficial to this country.